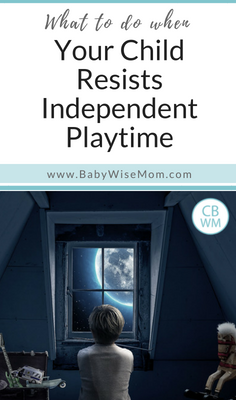 What to do When Your Child Resists Independent Playtime. How to get your child back to playing independently without tears. Brayden was doing so great with independent playtime. He was up to about 30-40 minutes. We had worked to get there. He didn’t love it initially. But I had persevered, and he was up to 30-40 minutes quite happily. Then around 7-8 months, he started standing up in the play yard and for some reason that set him off and he hated independent playtime again. My reaction wasn’t necessarily the best. I just didn’t do solo playtime for a few months. Every now and then I would try it, but he would still scream, so I just put it off until he was old enough for roomtime. Now that I am wiser and more experienced, I would stick with it. I would be consistent–do it every day. If all you can get is 5 minutes, take it. Work your way back up to your optimal length. If your baby is old enough and you feel comfortable with it, you can also start to have some roomtime. The hard thing with roomtime is that it takes a long time (for me) to work up to it. I sat with Brayden for weeks and slowly became less interactive. I also watched him carefully to be sure the room was totally baby-safe. I am lucky that we have the space that I can make a room baby-safe like that. I really think oldest children are often the hardest to get solo playtime going well. Younger children get it from birth just because mom can’t pay all of her attention to every child. The oldest is accustomed to mom doting over every little chirp, while younger children share mom’s time with siblings. Despite the difficulty, independent playtime is definitely worth the effort. If you could make sure you had a safe room, you could put a baby gate in the doorway so you could hear better, or a monitor in the room, and let her play in there. I would work up to it slowly again. Brayden now does really well with independent play, and has since he was 14ish months old. He loves it. He tells me he wants to play longer when I go to get him. So if your child starts to protest independent playtime, don’t fret. You can get back to where you are. Kaitlyn has never resisted it. She has always been just fine, and at 14 months, we have never had a crying session in conjunction with independent playtime. I attribute that to a couple of things. One is that she is not the oldest. Another is that I started having her have forms of independent playtime from birth really. It has always been a part of her life. Next Post Poll Results: What age did you introduce solids? I used to do play yard time when my son was small but because of one thing or another it fell to the wayside. My son is now 2 1/2 and wants me to play with him or at least be in the same room as him most of the time. I have starting independent playtime this week. My son hates to be in a room with the door shut except for sleep time. My question is do I just leave the door open? and if I do, do I punish him if he comes out of the room? I know he needs to obey mommy’s commands, but I don’t want him to connect independent playtime with punishment. I have my thoughts, I just want to hear what you suggest. thanks. It depends on the day with Gabby. Some days she can stay 20 mins, other days it is a fight to get 10 mins out of her. I can only do it in the afternoon because I work in the mornings. Just y-day when she was crying at 10 mins I was wondering if it was worth it. Ha. Thanks for this post. I will keep it up…even if it is short. Do you do independent play time on the weekends? Should independent playtime be in a pack and play? Or could it just be in another room? Christine, If it were me, I would shut the door–at least until he will obey your voice command to stay. You could also use a baby gate in the doorway. I would make sure you can hear him well; if you can’t hear him well, use a monitor. Good luck! You can certainly still do this. Jennifer,For the weekend, it doesn’t always happen. For Saturday, Kaitlyn usually does get her independent playtime–unless we are out and about. But 95% of the time she gets it. Brayden is often outside with his Dad in good weather and doesn’t get independent play. He probably gets it about 70% of the time. For Sunday, Kaitlyn gets it if she is ready for church early. Our church is at 9. So if she is ready early, she has it. Brayden never does.I would shoot for 5 of 7 days. Heather, The pack and play teaches boundaries and teaches your child to accept boundaries. So there is benefit to the pack and play. 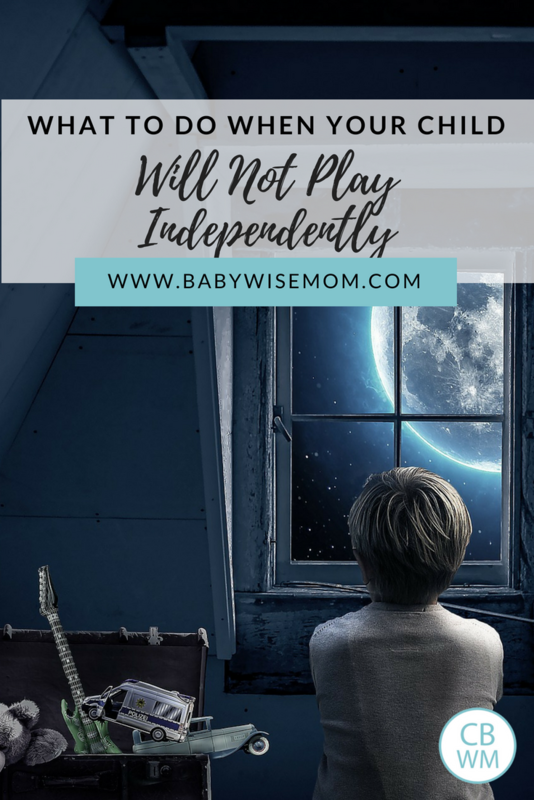 BUT, if you don’t have a pack and play, that doesn’t mean you can’t do independent playtime. You can do it in another room. Just make sure it is 100% babyproof. Just wanted to share our experience with independent playtime. We adopted our son (our first child) at 10 months, so obviously, independent play was foreign to him. Since he was not introduced to this since birth, he HATED being in his playpen unless it was for a nap or nighttime sleep. However, at around 14 months we started doing Room Time. At first we left the door open and he cried the entire time if he could not see us. We started with a 30 min. timeframe (although now I would’ve done it in smaller increments and worked up to longer time periods). Eventually he stopped crying but he was constantly stepping out of the room. He would stay in there for a little while but always pushed that boundary. We did not have a baby gate but since we knew his room was safe, we went ahead and started closing the door. He cried and screamed the entire time the door was closed……until I finally got wise and began using a timer. I told him Room Time would be over when the timer went off and I would wind it up and set it right outside of his door so he could hear it ticking. At first, he didn’t understand what that meant so he still cried, but eventually he learned that the door would not be opened until that timer went off. He is now 20 months old and I’m pleased to say that he LOVES being in Room Time! He stays in there an hour and when I tell him it’s Room Time, he will run and get the timer for me and start pulling out some of his toys. When I open the door after the timer goes off, he always has a big smile for me (unless he falls asleep, which sometimes happens). We have a routine where I tell him he’s in Room Time and I get a “Yes Momma” from him. Then I give him his panda (it’s like his pacifier or blankie) and make sure he has enough toys to keep his interest. I also make sure there’s music or other noise outside his room so it’s not totally silent. And I always open the door as soon as the timer goes off so he knows what to expect. I would encourage parents to keep at it and stay consistent because eventually, they learn to like it, even if it’s introduced after they’re a year old. I have a question about schedules for a 10 month old. My son will be 10 mos shortly and I am looking for a sample schedule. I started out babywise and now I feel like I have lost my way. It seems like the only time he goes down for a nap is immediately after I nurse him! Not what I want and I know that is not what is best for him. It seems like he can eat less often then his current every 3 hour schedule but I do not want to compromise my milk supply. He is teething and has been refusing to nap for the past couple days – but honestly I think it is because I am missing his cues and he is overtired by the time I get him to bed. Any help or guidance would be much appreciated!!! Also – I try to feed him solids immediately after nursing him but he is not too interested and would prefer to wait….which also throws off our schedule. I started writing down his schedule today and this what I have so far:7am – nurse + solids9am – nap (cried only for 8 minutes before falling asleep)10:30am – woke up and was content so I let him play in his crib until 11am…I was striving for him eating and waking at 11:30am11am – nurse + solids….not interested in the solids at all12:40pm – nap….I was striving for 1:15 but he was falling asleep in the car. He cried for 30 mins and I felt my milk come in so I went an nursed him….I put him back down at 1:40pmYesterday he missed his morning nap because his sister had gymnastics and he took only one nap – needless to say his eyes are red and he is very tired! I noticed that he is getting up earlier everyday. I would love to have him wake at 8am but I fear that will never happen! Just recently I started with a personal trainer (who is not that good since she told me to take in only 1200 calories even though I was nursing!) and I noticed my supply greatly decreased. I have since upped my calories and started taking fenugreek again – I am almost back at where I was!In any case…I need help!!! Thank you!! Thanks Denise! Thanks for sharing your story. When should you start independent playtime? I have a 3 month old and we have a schedule set. 7:30 — Eat9:00 — Nap10:30 — EatNap2:00– EatNap5:30 –Eat8:30 — Eat and bedWhen should I start working on playpen time? Also, at what point do I drop the 10:30 feeding?? Abby,I would set your independent play at a time when you know you can be really consistent. For me, that is the first waketime of the day. Other times of day tend to be different often (with errands and such), so I do it at the first. You could also do it after your 5:30 feeding if you make dinner or something at that time. Pick a time that works well for your family. I would even suggest you do it two times a day. So pick two times of day and do it for 10-20 minutes at a time. You can start the playpen now, or you can wait until baby can sit on own. I would sometimes put Kaitlyn in the playpen with a mobile and some toys in reach when she could only lay.Do you mean drop 10:30 AM or PM feeding? I mean drop the 10:30 AM feeding. I am just not still sure how much/many times she should be nursing. I wish that there was a “typical” schedule that told me everything. There are so many books and everything is soo different! Thanks for your help and for all of your advice. Hi there. What’s the best way to handle independent play time with twins? Should they be in the same room? Different rooms? I haven’t started this yet, but I am very interested in adding this to our daily schedule. They are only 7 months old, but they generally like being around each other. Thanks for your thoughts on this. I would do them in different rooms. You can also have sibling playtime (there is a post on that under siblings). But you for sure what independent play for each. Hopefully you can put them in different rooms at the same time (since that would be a nice break for you). Though you could also do individually and have one on one time with each twin. Dear Valerie, we moved almost three weeks ago and it´s time now to work on a routine. Andělka didn´t have her solo playtime for a very long time. She didn´t have it since we are here in our new house, and some time in our previous place. She´s one and a half years old. We did playpen time. You adviced to start a roomtime with her. I am now decided too start with a roomtime but I have fears about it. She was quite happy with her playpen time months ago, she didn´t cry at all or she cried a lottle in the beginning of her hour, which means a minute or two and then she was happy. But then something happenned, we tried to teach her to come on command and switched her when she didn´t come and we did this right before her solo playtime. After this frustrating experience she was left alone to play and she probably thought it was a punishment, as we sometimes used an isolation as a punishment. From this time problems with solo playtime started. In the end she hated to be left alone. She cried as soon as I said: "So, Andělka, now you will play nice alone, and after you play Mama will come for you." I put her in the playpen and she cried and stretched her little arms to me. Torture. It lasted for weeks. I started to be weary. I stopped solo playtime. Today I decided to do it again, this time roomtime. It´s going to be difficult – her room is our sitting room as well. We have only two rooms here and a kitchen. Also, my husband´s parents are living downstairs in this house, they have only one room – kitchen and bedroom all together. They like to spoil Andělka a lot. She stopped to eat her porridge and natural yoghurts, because they taught her, when she didn´t like her food, they gave her what she liked. She didn´t obey me. Today I was so down that I cut myself with a knife. I didn´t want to kill myself, just to make myself pain. I was spanking Andělka a lot, I lost my nerves, I was screaming at her, crying, frightening her with talking ugly on her. My husband put plasters on my cuts and decided that I must be more firm with Andělka from now, and we talked about solo playtime again. So all evening I study this blog to get some ideas. I appreciate Denise´s experience (above) but I don´t feel like making her cry in her room alone. I am a weak person and I prefere to do it like you did with Brayden – first to set the time every day, and play with her, and slowly let her play alone. You say above: "If your child is happy with the whole situation…" The trouble is, our life changed with moving. We had some routine, now we don´t. We needed to unpack, so Grandmother had Andělka long hours. I also can´t imagine how the process will go with getting her used to play alone with me being there, first playing with her, then just looking, then going away… How long should it last??? We did a lot of mistakes in our previous home, for example we spent a lot of time in her room with her, just sitting there and looking at her, we weren´t much creative to play with her, she isn´t trained well at all in obedience, she doesn´t obey "do not touch", only sometimes. She fears the Father because he spanked her a lot, so she obeys him, and she doesn´t obey me, as I am weak and too soft. I decided to study diligently the books again, and this blog. We desperately need to start a routine!!! Grandmother thinks it´s a nonsense, but this is OUR family, OUR responsibility in front of God for our child!How long would you let her cry? How would you do all this in my situation? Elaine, yes, you can use CIO.I would suggest that you get a timer. Set the timer for five minutes (you can start with less time if needed) and put baby somewhere interesting to play. Tell him to have fun and be happy. Then leave him. Once the timer goes off, go to him and ask him if he had fun and be really happy. Don't give him a "poor baby" routine. Act like nothing is wrong. Do this once or twice a day. Do it soon after a feeding so he is well-fed and well-rested.Once he will play happily for 5 minutes, try 7. Then 10. etc. Work your way up to the appropriate length for his age. Good luck! Thanks very much Valerie. It really helped!!! I have now placed my baby to play on his own soon after feeding and use the timer. And it worked!!! And he now managed to stay on his own for 15 – 20 mins!!! The only thing is that he doesn't seem to be so interested in the toys, but he just lie there, lazing around for 15 – 20 mins, sometimes, playing with his toes, but not the toys (I am pretty sure the toys I placed are interesting). I hope that is ok, and that it will not affect him developmental wise. Glad to hear it Elaine! Thanks for sharing! Have you ever tried putting a gym or something for him? He is pretty young to just grab at something laying next to him. But if you have something interesting for him to look at and bat at, he might play more. Apolena,I wouldn't start the roomtime until you are all unpacked and settled. Wait until you have the time to devote to getting things back in order. One you are settled, start roomtime like I did with Brayden. It took us weeks and weeks to go through the whole process. Don't worry about rushing it. 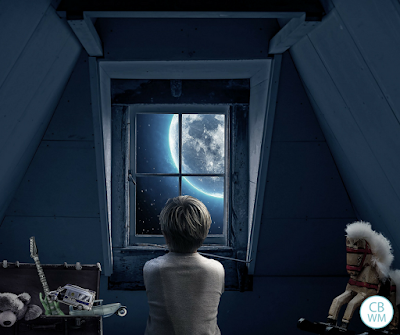 Brayden still plays great in his room alone. I also want to encourage you that you do not need to use spankings to get her to obey you. I never spank my children, and neither does my husband. Our children are very obedient. It is not necessary. You can teach her obedience in others ways. Be sure to look at the blog label "discipline" for all of my ideas.As you apply these ideas, remember that it is a learning process. She won't be better immediately. It will take lots of time and patience on the part of both you and her. She is very young. Give her time to learn things. She will get there 🙂 Remember it is a journey, not a destination. Be sure to ask me questions as you have them. Thanks Valerie for your idea on the gym. The thing is that we have a gym from IKEA. We placed our baby Joshua in the gym since he was a newborn, and he never liked it. We thought that it was because he was still too young, and that he will like it when he gets older, but he is now 23 weeks old and he never did like the gym. He only bat at the toys once and then he got bored and never does it again. In fact, he will complain and cry whenever we put him on that gym. So we stopped putting him on that gym. As I ponder over your suggestion, I remembered we visited two different friends on two different occasions, and I remembered that I noticed that Joshua actually enjoyed batting and grabbing at the toys on their gym (their gyms also looked more sophisticated). I am now wondering whether it is because Joshua simply didn't find the gym we got from IKEA interesting and whether I should go to the store and buy another gym (the gyms he batted at my friends' house). But I am afraid that I will waste my money, if I now hurry out and buy a different gym, and he again didn't like it. If you have any suggestion if I should get a different gym, I would like to hear. Joshua is now in his 23rd week. I have decided to go and buy a new gym which was on discount. Good news, it worked, and Joshua enjoyed batting at it, pulling at it, at least today – the first day. My problem is solved 🙂 Thanks so much to you all for the suggestions!!! I did Independant playtime and it always went well except when she was ill wich is understandable.She did great with 45min in pack 'n play. Then we moved and I did not totally worked on it and then I did it and for three days she did good, no changes the same as usual. But now for the past three days if I put her in her pack 'n play she starts crying emmediately. The first day I just took her away and did something else. The second day the same, so now I decided to sit with her, she still cries and wants me to take her out but I don't. So she quiets down but as soon I try and leave she screams again its more of a cry.So now I just sit there. I don't interact with her I just sit there.She is cutting a tooth and she started walking 3 days ago. She is turning one in two days.Is what I'm doing okay or should I leave her in the room?And when do you start Room time? Elaine, I am glad it worked out! If your gym is something you could clip things to, you can change it up. Our gym has things velcroed on it. I can take those toys off and put on other toys that you clip to carseats and the whoozit activity spiral. It mixes up the gym to keep it interesting. fickchantellelee, I would leave the room. It isn't fair to ask a child to play alone with mom right there. I would set a timer and tell her when the timer goes off, you will come get her. Start with about 5 minutes and then add time slowly once she is able to play happily for 5 minutes.See the post "roomtime" for more on that topic. Valerie,Thank you so much for this website! I am trying to implement roomtime and having a hard time! After reading the posts I feel encouraged and ready to persevere! Thank you! Hi Valerie,My son is having a hard time with independent playtime. He's 8.5 months old and we just began to implement it (he was a preemie, so he's more like 6.5 months). He has a play center in the front room of out house and he would play great by himself. Now I'm starting to separate Independent Playtime vs Free Playtime. For IP, I've started to put him in his pack n play and he absolutely hates it. He's never had a problem with the PnP in the past (sleeping in it). Even when I just turn my back to walk away, he screams and screams. I've tried going back to independent play in his play center, but now he screams even when I leave him there. I'm not sure what happened! I have always said that my son Elias and your son Brayden are two peas in a pod. Our stories mirror each other so much. Whenever I have had a question about Elias, I can go to your blog and find that Brayden was the SAME EXACT WAY. Whatever you've tried with Brayden, has always worked with Elias too. Can you tell me how you got Brayden to enjoy IP time? I didn't push it with Brayden and just waited until he was 14 months old and we started room time.I would suggest you try turning some music on. Do it in the morning sometime. Do 5 minutes at first. Be happy when you get him up. Once he can do five minutes, then move it to ten. Some moms say their child never improved with five minutes and say they need to start with at least ten. So start with five, but if you don't see improvement, shoot for ten for a few days and see if that helps. I just want to encourage everyone to stick with independent play time! Our daughter started crying through the entire thing when separation anxiety was at its peak – around 8-10 months. I couldn't even get her to sit for 5 minutes without crying…so we just let her cry in there and came to get her when the timer went off. As soon as she learned to crawl, her separation anxiety in general was much better, and she started crying for only the first few minutes…now she is 1 and we're starting room time today; she doesn't cry in the pack and play at all anymore! It's so worth it! My daughter is 13 months old and we've been doing independent playtime successfully for most of her life. She does about 30-40 minutes per day. Suddenly, for a few days now, although she enthusiastically walks to her playpen, as soon as I leave the room, she cries and cries. Is the strategy to leave her in there and she'll get used to it again or get her out after 5 minutes of crying and start from the beginning again? Thanks for your help! My daughter did so well with roomtime. We were up to about 45 min and things were fabulous. We'd leave the door open and put a rolled up blanket in the doorway (she wasn't advanced enough to scoot overt it) and she'd whimper for a few seconds then be fine for the rest of the time. But ever since she's started crawling, we've had to either close the door or user the baby gate and she SCREAMS when we leave her like this. I don't understand it, because the baby gate isn't much different than a blanket (she can still see out the door), but she can't even make it a couple minutes now. I'm not really sure what to do. As soon as I come and sit with her, she's happy to play with her toys. She doesn't even care if I play with her. She just wants me there. I like this timer idea, and I think I'll try it next time, but has anyone else had this problem? What did you do? Tricky situation. I would go with the timer and work back up. I would guess she is just upset now that she can move and has an option of leaving but is blocked. Really it is a situation of her having more freedom than she is ready for. At her age, a playpen is best because it keeps her boundaries smaller and more age appropriate. So you might even try that instead. Hi there! My son is 9.5 months old and HATES being alone. There are times he is content to play on the floor on his own (he's not crawling yet so he pretty much stays in one spot) but ONLY if someone is in the room where he can see them. About a month ago (I started this so late due the the fact that I felt like he needed to sitting completely on his own and he was pretty late in developing that) I tried to start independent play time in his pack n play and set a timer for 10 minutes around the same time every day. Well, he screams the ENTIRE 10 minutes. For a while I tried being completely out of sight, I've also tried coming in and out and sitting right next to the pack n play but ignoring him. Not only does he hate the pack n play now, but it seems to have gotten worse in other areas as well. He screams if no one is the room with him (unless it's to put him down in his crib to sleep for naps or for the night) and then cannot calm himself down. I play with him or try to distract him with songs or toys when this happens but holding him is the only thing that will calm him usually. There are times when he's awake I simply cannot hold him though and I need him to entertain himself (like getting ready to go somewhere or unloading groceries or making myself something to eat or using the restroom). It's exhausting and I'm not sure how to break it. It's not a situation where I can simply let him pitch his fit anymore, he doesn't stop (which only makes me and my hubby more and more frustrated which doesn't help him at all). Help? Hi Ruthie, I have a post on starting late:http://www.babywisemom.com/2010/10/starting-independent-playtime-late.html?m=1I would follow the steps there. You start by playing with him, then have him play but you read or something–don't be interactive as much as possible. My son was very similar to how you described and that post explains what I did to help him along. Let me know if soemthing doesn't make sense. Hi Rachel,I am so glad the blog has been helpful! If it were me, I would go for room time and skip the crib. 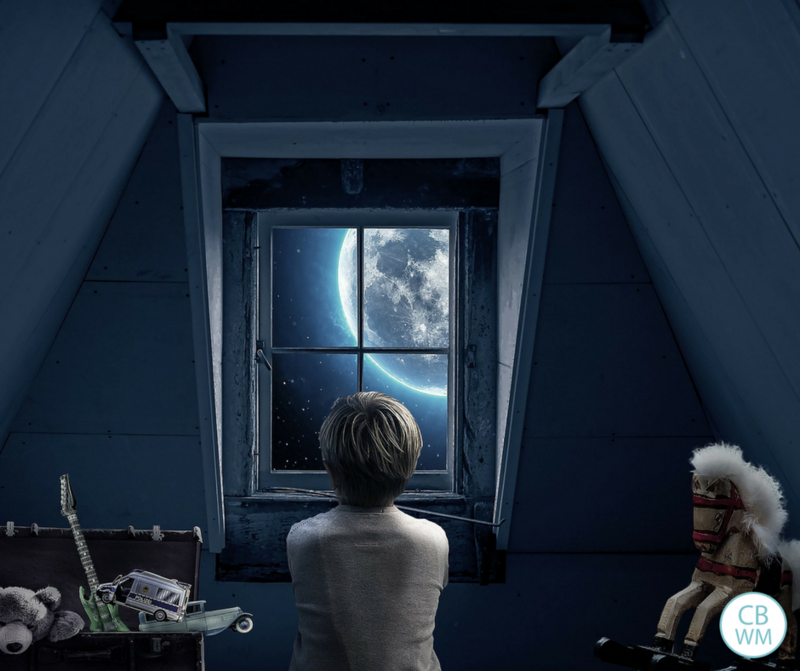 Just be aware some kids feel overwhelmed by a whole room. I had one child who preferred the playpen for a long time. But most kids the age of your girl would be happier in room time.